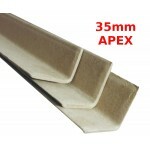 Below you can choose from either our Plastic Pallet Edge Protectors, or our Cardboard Pallet Edge Protectors. Our Cardboard Pallet Edge Protectors come in a range of different lengths, and apex sizes depending on the size of your pallets. We may also be able to manufacture custom size cardboard pallet edge protectors designed specifically for your requirements. For further info, please feel free to give us a call.